Posted on 4/1/2019, 11:40 am, by kittykill, under General Projects. What do you do when you are craving a snack but need that something good for you? You make Granola Bars, of course! Blackstitches share their recipe for this delicious treat that you can have any time of the day. While it may seem heavy, it is packed full of ingredients that are good for you. You can make several batches ahead of time and freeze them for future noshing. This recipe is a great base for other flavors. Add a little chili powder for some extra heat or go sweet with more chocolate chips. 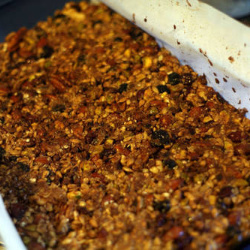 Granola Bars will stay fresh for up to one week if you do not freeze them. Trust me, they won’t last a week. Be careful when giving these to little ones as the small pieces of nuts may pose a choking hazard. Get your snack on with recipes from our Cooking Board. Have a tasty Monday!